To monitor the temperature of the fiber, the connectivity and the fiber break, a double-wound copper wire is used. Over connectivity of the fiber connector the circuit is closed. The principle is based on applying voltage at temperature-dependent resistors, which is proportional to the respective resistance. If the voltage falls below the lower or the upper limit, a relay switches, interrupting power transfer to the laser. 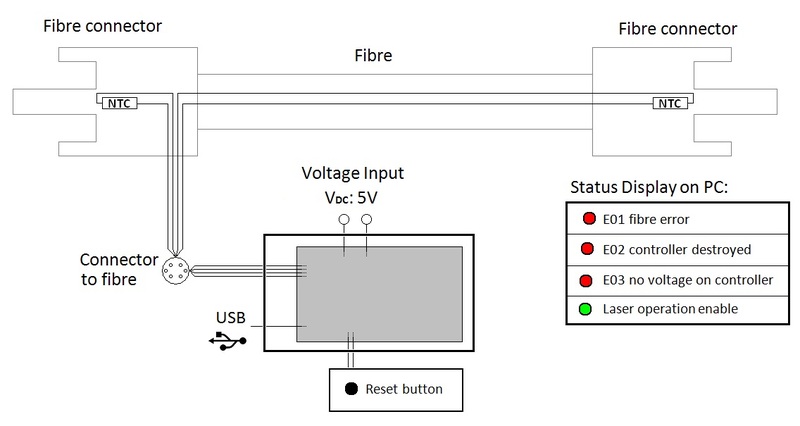 In monitoring the fiber, the upper limit voltage serves to protect against fiber breakage, while the lower limit voltage bridges the contacts for connectivity. In monitoring the fiber connector temperature, only the lower limit voltage is used to prevent the fiber connector from overheating.